We just can’t get enough of this manual labor stuff. Seems like the minute we get something “done”, we start something else. I guess it is how things go in general… if we really ever finished, what would we do with all our free time? We might actually enjoy something… food for thought. Last weekend we had decided that we would get up early on Saturday and hit up some garage sales and see what we could get at a highly discounted price. So we picked up a paper the day before and plotted our course and by 7:30 we were out and about – trying to beat the early birds. I will save the garage sale stuff for another post, but afterwards we headed to Lowe’s, Home Depot, the flea market out, Aldredge Gardens (nursery), another nursery & Westlake Hardware. A busy morning to say the least, but by 12:30 we were back at home with all our supplies needed to flip our 3rd and final flowerbed. We had been putting this off, since we weren’t too sure about doing it since the dogs like to spend time in flowerbed and we didn’t want to create just a pretty place for them to lay and chew random objects. We redid one of the flowerbeds that surrounds a big tree in the backyard and by putting some of that ghetto fencing around it – we have kept them out of it for the most part. 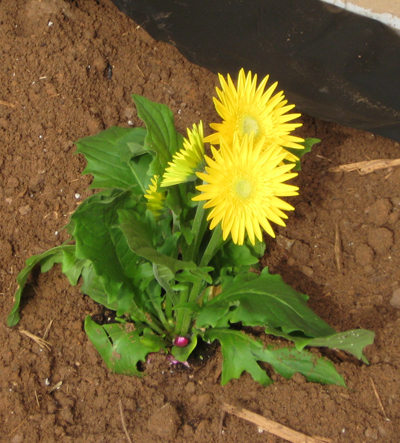 We figured if we did the same to the bigger flowerbed, we could redo it as well. After dropping about 100$ on supplies (you know your normal trip to Lowe’s, Home Depot or wherever your vice is) we had everything we needed to get going on the flowerbed. Wait… everything besides a crew of workers to do all the digging. Shite… I knew we missed something. Shala ran the shovel & rake like a pro, shedding her gloves from time to time – which is more than I can say. I have fragile hands that type for a living… I have to keep my game tight. haha Plus I had already blistered up my hand the day before doing some other random crap that needed to get done. So with it all cleaned out the next step was to get the plastic laid down so that it wouldn’t eat through the shop and one day after a weekend of rain I walk in to cut a few boards and find myself dancing in a field of daisies. So we did that, which was pretty easy. Then guess what??!?! Yup, lets start shoveling everything BACK INTO the flowerbed. We love moving earth – it is our favorite past time. This takes considerably less time, since the dirt is already loosened up and its a matter of just throwing it back and raking it around. Shala and I took turns and knocked it out fairly quickly. Yeah right, it probably took an hour or so. That’s a lot of work! Now we finally got to the part where you start to see a difference. 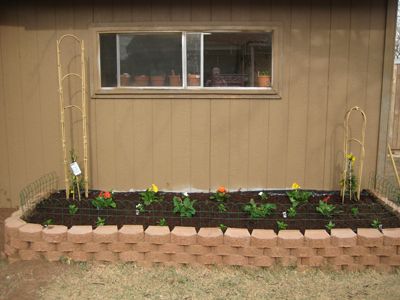 We set out all the plants we had bought, 7 daisies of various colors, 15 vincas (white) and two yellow jasmine climbers. 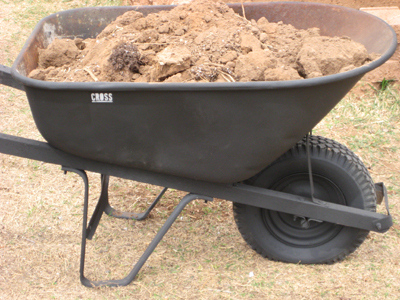 This is very important to do prior to just digging holes and just putting stuff in the ground. We spent about 15 to 20 minutes on this, setting things and arranging them. Tallest in the back, evenly placed. After our OCD-ness wore down a bit, we were ready to start digging our holes for the flowers. This takes no time at all, since the dirt is loose and we had them planted in about 10 minutes. Shala did most of that, since I am fat and couldn’t bend over without the threat of passing out – haha. Afterwards we placed a few bamboo structures for the jasmine to climb on. We actually had purchased them for our grapevines that we still haven’t planted and once we started reading we realized that grapes would be too much for those tiny things. 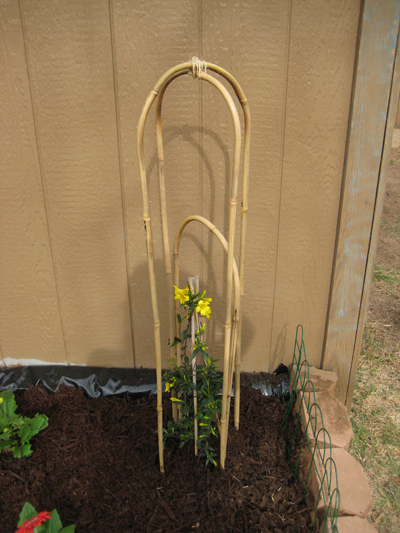 Instead of just chunking them, we decided to use them in the flowerbeds for the climbers. Pretty cool and we probably spent a total of 7 bucks on the parts to make them. We placed them on the ends so each would have something to climb on. Turned out pretty cool for the most part. Finally we were ready for mulch and fencing that is like the cherry on top when you have put 5 hours in on a flowerbed. The mulch went down easy, covered well and looked great. We went with a red-ish color this time and it helps to prevent weeds and keeps those babies a bit more watered (after watering) than just dirt alone. We put the fencing up and dusted our shoulders off like the pimps we are. Check the pictures below for the finished product and some close ups of the plants themselves. 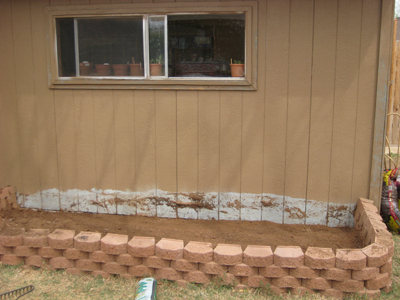 The finished product – not bad for a day’s work. We went with bright yellow, orange & red – simple and solid colors. They look great against the mulch (not seen here). The bamboo we used for it to climb on, cheap and easy. Murdered out and still doing work. Need to air up the tire. No – they didn’t have little mini shovels. 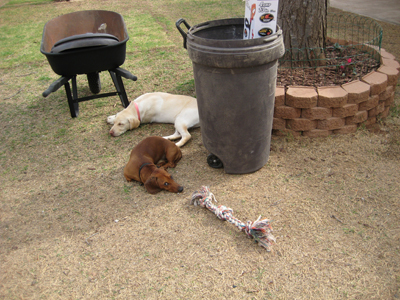 They did no digging, however they were soooo tired.